Recently, I read about Extreme Feedback Devices (e.g. lava lamps). The idea is to set up a physical device that displays the current status of an automated build in an eye-catching way, so that it is really hard to not recognize that the build is down. I loved the idea and decided we have to have an Extreme Feedback Device (XFD) on our own. I wanted an especially cheap and simple solution. 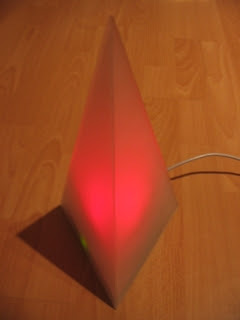 I used a mySmartControl M8 board with an ATMega8 AVR RISC microcontroller from Atmel, modified the circuit of a cheap LED effect lamp and connected it to the microcontroller, so that each color can be switched on and off individually. The microcontroller board has an USB interface and shows up as a virtual COM port. A small C program running on to the microcontroller listens to commands sent via the COM port from the PC and reacts by switching the LEDs on and off. On the PC a Java programm polls the web page of the build server and sends commands to the microcontroller utilizing the serial communication library rxtx. After using the device for a couple of days it turned out to be very useful, if the device flashes a couple of times when the state changes, so that one recognizes a build failure immediately, even from the corner of one's eye. As the device has also a blue LED, and can therefore display basically arbitrary colors by mixing the primary colors (RGB), one can think of visualizing additional aspects of the build status. 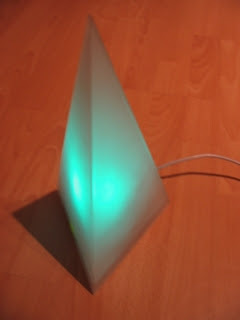 Thie link to the LED lamp is broken, which lamp did you use? could you give a link to the ready to use example programm or was this part of the board? Yes the microcontroller program was one of the examples included on the driver CD. We ended up using a giant siren like this.